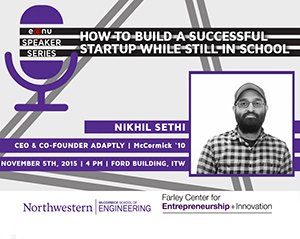 Digital signage within the Technological Institute and Cook Hall provides opportunities to promote sponsored Northwestern Engineering events and student groups, as well as select Northwestern University announcements. Refer to the information on this page to learn more about posting a digital signage ad to the monitors. We encourage all groups to consider using the PowerPoint template shown below when creating advertisements. Be sure key information is most prominent. Abstracts and event summaries should be limited to one sentence. Use no more than two images per ad, and leave space around the edge of the ad to avoid crowding. Submit all completed ads to: tech-ic@northwestern.edu. Provide the PlanIt Purple link for your event in your submission email. Ads for events without PlanIt Purple links cannot be posted. Ads should be submitted at least 48 hours in advance of the desired run time start date. Ads generally run for 1-2 weeks prior to the event. Please allow 1-2 business days for your ad to be posted. Double check that your ad meets the size and formatting specifications above. Northwestern Engineering has the right to review, approve, and reject content if ads are not deemed appropriate. Northwestern Engineering has the right to disallow and take down any ads. Ads may be rejected based on conflict of interest with Northwestern Engineering. Northwestern Engineering may ask to limit the number of ads running from a single department or organization at a given time. Submitters are encouraged to consolidate multiple events into a single ad whenever possible. The automatic text feed of events shown on the monitors pulls from pre-selected calendars in PlanIt Purple. If you do not see your event showing on the hallway monitor calendar feed, please contact web updates.